Citysightseeing Tbilisi evening river cruise offers you to explore the city from another unique viewpoint. You can enjoy panoramic evening views. The boat trip covers some of the most popular tourist attractions, including Mtkvari river old town surroundings, Metekhi crag with traditional architecture houses on top, sulphur bath district, Rike park, Peace bridge, House of Justice, Gorgasali alley and more! The trip is one of a kind in Tbilisi and provides best value for families, friends, couples and solo travellers. Tickets can be booked online with promotions - here, at our office (Meidan sq. ), or at the boat stop. Please make sure to check the timetable with our office for departure times. 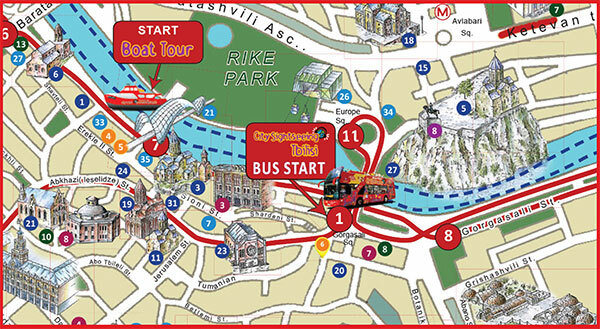 See a quick MAP for the detailed route or download a full printable PDF map here. We wish you a pleasant stay in Tbilisi. Thank you and enjoy your trip!